Last night, it snowed. It was a light dusting but I like it when it snows at night. It's very peaceful. (I've written about snow before, here.) Snowing at night is still peaceful for me even when I'm outside and not warm and cozy indoors. Actually, last night I was in the snow: biking. That's a first for me. Biking in the fresh snow, you start to hydroplane a lot. You may have last experience hydroplane while driving, it's that moment where you lose control of your vehicle, and the tires sort of lose grip of the road and slide a bit. That's hydroplaning. You can imagine that to occur more often with slippery snow and bike tires that are designed for less friction. I was very careful and biked on the sidewalk when possible, especially since I didn't have my helmet or light with me. Biking in Boston has gotten a little bit more dangerous. I'm not really one to change my habits because of freak accidents. But the thing is that two freak accidents involving cyclists happened late last year in the span of a month: one cyclist got clipped by a public bus and died, and another cyclist collided with an 18-wheeler truck turning right from the left lane and also died. Both of them were BU students. These tragic accidents have put a bit of strain on the university and its students. University officials, city officials, students, and parents have started to wonder if these two accidents could have been prevented. There are a lot of opinions. Some even try to put blame on the cyclist for their carelessness, which I don't agree with but I'll save you from my rant. I also can't help keep the question "what if it was me?" out of my head. It easily could have been me. Surely, my parents would be devasted. And of course my life would be over. So I bike now with these tragedies in the back of my mind. 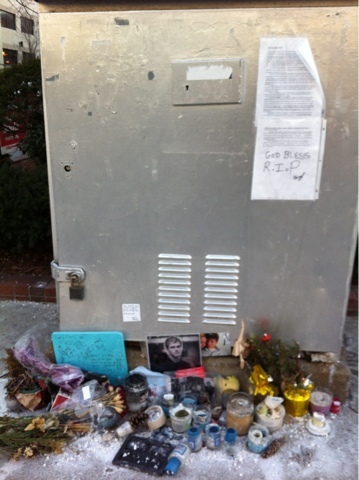 Here's a tribute for Christopher Weigl at the site of collision of the second accident I mentioned. I just recently saw this last week. It's a very nice act of thought.